When it comes to high quality elite lockers, CS Storage is one of the leading providers for locker solutions! We have a wide selection of elite storage lockers in our online store which come in various colours and door options, which makes our elite storage lockers an ideal choice for schools, hospitals and businesses. • Strength – Our elite storage lockers are welded and riveted in construction with reinforced doors. 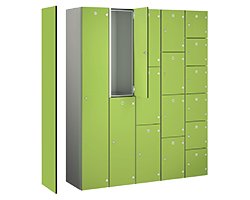 • Hygienic – All elite lockers are anti-bacteria powder coated. • Versatile – choice of 1 to 8 tiers, a range of colours, single or nested, stands, sloping tops, plus more! All of our elite storage lockers come with a 0.9mm steel carcass, welded and riveted in construction to ensure they meet the highest standards. The components are polyester powder coated prior to assembly to protect all surfaces. Also, our elite lockers come with 2 keys per door and cam locks. If you want to adapt the locking mechanism, door colour, size or accessories, select the options on the product page and we will design your locker to your exact specification. For the majority of businesses that employ a variety of staff or large organisations such as schools, hospitals or universities, our elite storage lockers are for employees as well as visitors. For health and safety purposes, these lockers can help keep corridors and hallways free of clutter ensuring that exits and fire escapes are kept clear. If you are limited for space, our elite lockers can be fitted with integral seat stands to maximum the use of your locker room. For any help or advice on making the best use of your space, visit our locker room tab. If you require any extra security for your elite storage locker, we would advise you on purchasing a padlock fitting options (which is free at point of order). The storage locker range is coated in anti-bacterial powder to help prevent the spread of infectious diseases and reduces the risk employees and students getting sick. We are confident that our elite lockers are the right solution for you. If you require more information about our lockers, call us on 01772 322634 and one of our friendly team members will be more than happy to help.